Create the div you intend to use as a dialog box. Create a div and give it an ID so that you can turn it into a dialog box node. Add the title attribute, and the title shows up in the dialog box’s title bar. 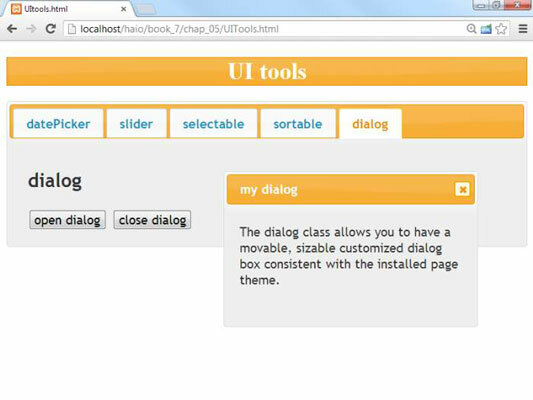 Turn the div into a dialog box. Hide the dialog box by default. Usually you don’t want the dialog box visible until some sort of event happens. In this particular example, you may not want the dialog box to appear until the user clicks a button. You can put some code to close the dialog box in the init() function so that the dialog box will not appear until it is summoned. Clicking the X automatically closes the dialog box. The dialog box has a small X that looks like the Close Window icon on most windowing systems. The user can close the dialog box by clicking this icon. You can open and close the dialog box with code.